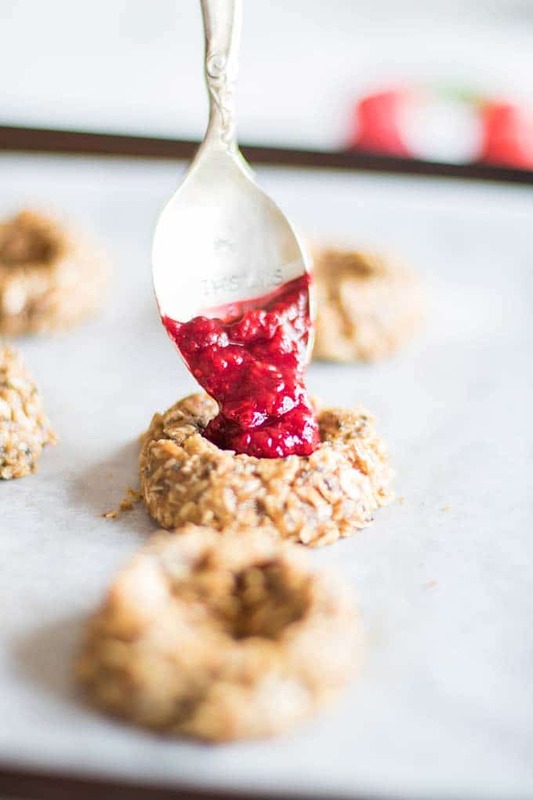 These healthy (almond butter and jam) AB & J Breakfast Thumbprint Cookies are a great option for busy mornings. 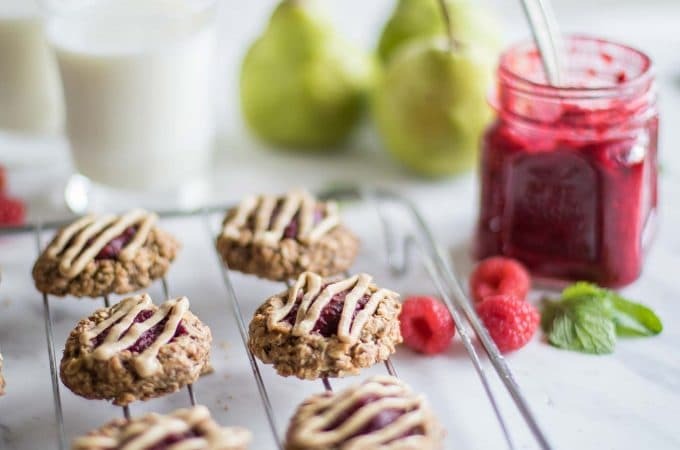 Topped with a fruit sweetened raspberry jam and a drizzle of nut butter, kids and adults alike love these vegan and gluten-free breakfast cookies. Hello! This is Michelle from Sunkissed Kitchen, long time reader and admirer of The Endless Meal, Kristen, and her recipe for The Best Chicken Tortilla Soup that's ever graced my dinner table. I am stopping by today to share my new favorite cookie creation with you. Before I do that, let me tell you a little bit about why I am here today. Developing healthy, but still deliciously tempting meals and desserts has long been a passion of mine. I adore good food, but I also want the food I eat to nourish and energize me. I started blogging 4 years ago, with the simple mission to help others find joy in creating healthier meals also. I believe that learning to love the process of cooking is one of the things you can do for your health. Two and a half short years ago, I had a son. He is a constant source of joy, frustration, and bewilderment. With my healthy eating habits and my enthusiasm for vegetables, I thought it would be a cinch to teach him the same. Boy was I in for a surprise. My strong-willed and intelligent child sure knows how to play me when it comes to meal time. I don't want to spend his childhood arguing over what foods he does and doesn't eat — which pushed me back in the kitchen, working on incorporating the ingredients I want him to eat (whole grains, nuts and seeds, fruits and veggies), into foods he actually wants to eat (cookies. period.). 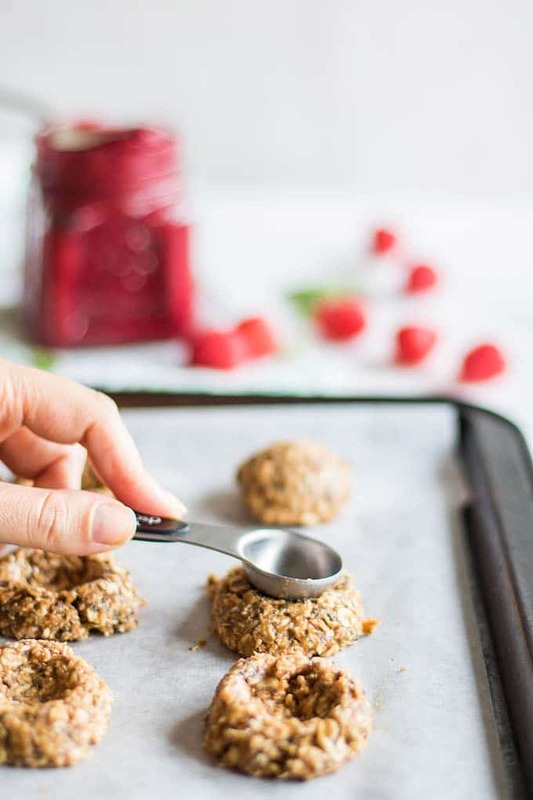 These easy chia oatmeal breakfast cookies are made with simple, whole foods – dates, oatmeal, chia seeds, coconut oil, almond butter, and raspberries. That's it. Magical things can happen when you combine pure whole foods in the right combinations. The cookie base is a combination of whole oats, chia seeds, almond butter, date paste, and coconut oil. The end result is a nutty and deliciously sweet cookie that bakes crunchy around the edges and chewy in the center. 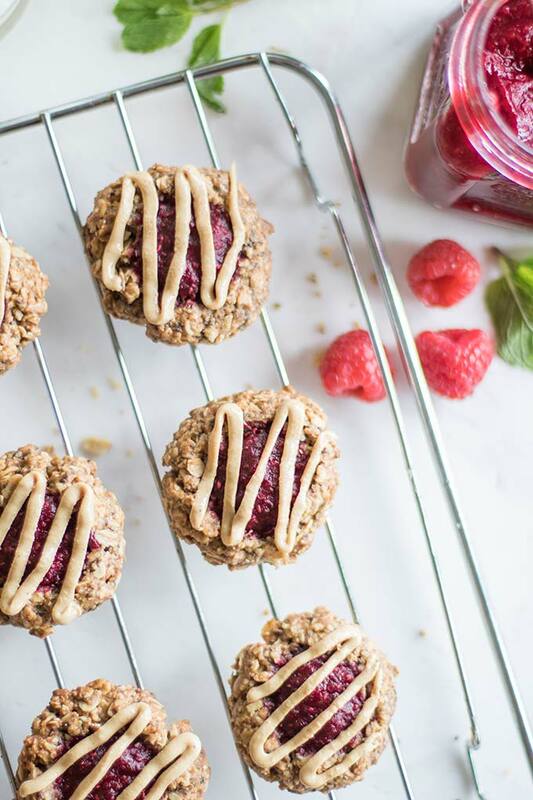 Top these vegan breakfast cookies with a dollop of date sweetened raspberry jam and a drizzle of almond butter, and you've got an easy breakfast ready for those busy weekday mornings. Kids adore eating cookies for breakfast, and if you're like me, feeding your child a healthy breakfast quickly is important to starting the day right. If you love this date sweetened recipe, be sure to stop by Sunkissed Kitchen for more! Two of the most popular recipes on my blog are also date sweetened – my Gluten Free Date Bars and my Chocolate Chia Pudding. My passion for creating healthier desserts has led me to writing an eBook filled with tons of delicious sugar free desserts, including these AB & J Breakfast Cookies and my favorite gluten free brownie recipe to date. Be sure to sign up for my mailing list to receive updates on the book's release! If you love these AB & J Breakfast Thumbprint Cookies as much as we do, make sure to give them a 5-star review in the comments below! These healthy AB & J Breakfast Thumbprint Cookies are a great option for busy mornings. Topped with a fruit sweetened raspberry jam and a drizzle of nut butter, kids and adults alike love these vegan and gluten-free breakfast cookies. Add boiling water to dates in a bowl, and allow to sit 2-3 minutes to soften. Add the dates and the water to a food processor bowl, and process until very smooth and the color lightens. This will make slightly more date paste than you need for this recipe, but I find it difficult to make less. In a small saucepan, add raspberries and date paste. Bring to a low boil over medium heat. Stir occasionally for 2-3 minutes, and then remove from heat. Add chia seeds, mix well, and set aside to thicken. Add oatmeal to a blender, and pulse 6-8 times. The oatmeal needs to be broken up, but not blended into a flour. In a mixing bowl, add date paste, almond butter, coconut oil, sea salt and baking soda. Mix well. Add oatmeal and chia seeds, and stir until combined. On a lined baking tray, scoop out 1 tablespoon balls of dough. I like to use a rounded tablespoon for this. Press a thumbprint into the center of each ball of cookie dough. I like to use a rounded 1/2 tablespoon for the perfect sized hole. Add a heaping 1/2 tablespoon of jam to the center of each cookie. Allow the cookies to cool completely, and they will firm up. Once the cookies are cooled, you can drizzle them with almond butter. I find that raw almond butter is easier to drizzle, but you can also just spread a little almond butter on top when ready to serve. To keep my cookies looking nice, I freeze them on the cookie sheet, and then stack them in containers to keep stored in the freezer. These cookies can be stored in the refrigerator up to 1 week, or in the freezer for up to 3 months. *Different brands of chia seeds absorb different amounts of liquids. The age of your chia seeds also affect their absorbency. If your chia jam isn't thick enough with 1/2 tablespoon, add an extra teaspoon or two. **Use leftover date paste to sweeten yogurt, oatmeal, or smoothies. **Save time by using a store bought jam. Look for one that is naturally sweetened with honey or fruit juice. These are the best cookies! My kids went nuts for them. Thank you! Aren’t they amazing! Michelle is a genius!! Thanks for sharing these delicious cookies with your readers, Kristen! We adore them. I’m so happy you did! They’re amazing! !